Sacerdotus: 3rd Sunday of Advent: Rejoice, The Lord is Near! 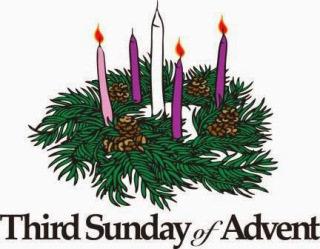 We are in the third Sunday of Advent and the celebrant of today's Mass will light the third pink candle. The pink is for the third Sunday or Gaudete Sunday which means “Sunday of Joy.” We are joyous because we are getting closer to Christ’s birth. As each week goes, we light the candle that corresponds to that week. Shout for joy! This is how the first reading begins. We are joyous! We sing joyfully and exult in our hearts (Psalm 30:12). Jesus is about to be born on Christmas. Not only are we joyous about His first coming, but also His second one. "The Lord has removed the judgment against you," God's mercy is rampant especially in this year of Mercy (Deuteronomy 4:31). Our King is in our midst in the Blessed Sacrament (Zephaniah 3:17). Our King is present in every Catholic Church around the world; in every tabernacle, monstrance, ciboria, and pyx. He makes Himself available to each one of us who prepare to receive Him (Colossians 2:6). We must not fear nor become discouraged as the reading tells us (Isaiah 41:10). Joy must be in our hearts always (Psalm 4:7). We must cry out with this joy because the great and Holy One is among us as the Psalm for today reminds us. Our Savior is among us. God is our savior (Psalm 68:19). We are unafraid and are confident in Him. He is our strength and is always with us (Psalm 28:7). God never parts from us (Deuteronomy 31:6). In return, we must praise His name and tell all nations or all peoples of the world the good things He has done for each one of us (Mark 16:15). We do this by the way we live our lives in the joy of Christ and by evangelizing (1 Peter 2:12). Pope Francis has said many times that we should not have "funeral faces." We must smile, greet others, demonstrate kindness, compassion and mercy. This is how we show our joy to the world because the Great One is in our midst. In the second reading, we are once again reminded to rejoice and be glad; the Lord is near! Because the Lord is near, we should not be anxious. Instead, we must pray and thank God without end (Luke 18:1). It is in prayer that we unite with God (Matthew 18:19). We begin to absorb the peace of God within our minds and hearts when we pray. The problems that phase us from this world will disappear as we learn to trust in God and rest in Christ Jesus. Finally in the Gospel, John the Baptist reminds the people that they must help others, especially the less fortunate. If one has enough, one must share with others who do not (Proverbs 19:17). Last week, we read about preparing the way of the Lord. This is one way in which we prepare ourselves to receive the Lord by helping others and not being attached to material things (Matthew 6:19). Owning things is not bad. Having money is not bad. We are material (physical) beings with needs and live in societies that have built economies that keep us dependent on money and other things. That is not our fault. We have to live in the system, so to speak. However, when we do have enough that just giving some of it will not have any big effect on our well-being, then we should make every effort to help others who do not have enough. If I have ten sandwiches and they will eventually go bad, why should I keep them stored in my refrigerator? I only need one sandwich, the rest I can give away to whoever has nothing to eat. Some fanatical right wing political supporters may call this 'Communism,' but it is not. Caring for others is not 'Communism.' Communism keeps people down. It does not let people gather wealth or improve themselves. John the Baptist, Jesus and the Catholic Church do not support this. What they call for is helping those in need (Luke 6:38). This does not mean that we have to get rid of all of our things just to be equal with everyone else if we are wealthy. What this means is that if we have enough, then we should help others with it and not store it up as if we are going to live forever to enjoy every cent and every atom in material goods. Doing good works, especially those of mercy are a preparation to receive the Lord (Matthew 25:31-46). These works is what put our faith into action (James 2:18). They present the Sacramental grace we received at Baptism to the world. This grace fills us with God's presence which is like a fire that cleanses the impurities of precious metals (Isaiah 48:10,1 Peter 1:7). Jesus brings us this fire via the Holy Spirit. We must prepare to receive the Lord and His fire that sanctifies us. In this year of mercy, what will you do to spread this joy? Will you help others or ignore them? Will you hold grudges or forgive? Will you just go to Mass and then go home to watch the sports on television or will you go out and evangelize family, friends and strangers? Rejoice always in the Lord. Spread the joy you have in the Lord to all you come in contact with. Become that pink candle on the Advent wreath lighting up those around you with the joy of Christ. Maranatha! Come Lord come!